Anti-Kadhafi fighters overran the port of Sirte early Tuesday, scoring a strategic victory in their battle for control of the defeated Libyan leader’s birthplace, his loyalists’ most important bastion. Hundreds of fearful civilians have fled the Mediterranean coastal city in recent days as the new regime’s forces have closed in from east, south and west. But as the National Transitional Council troops zero in on the centre of the sprawling city where Kadhafi diehards are believed to be holed up, the threat of destructive urban warfare street-by-street hangs over the remaining residents. “There were clashes in the night and we now are controlling the port,” said Commander Mustafa bin Dardef of the NTC’s Zintan Brigade. The port lies on the north side of the city but it is the city centre that Kadhafi’s compound and military bunkers lie and NTC fighters said they expected his remaining loyalists to put up fierce resistance. “As we move closer to the city centre, it’s going to be face-to-face street fighting and we are preparing for it,” said one fighter, Ali Zaidi. On Monday, NTC fighters captured a large weapons cache belonging to Kadhafi forces on the eastern outskirts of Sirte. Crates of grenades were loaded aboard more than a dozen pick-ups and hauled to a base by dozens of fighters shouting “Allahu akbar!” (God is greatest), flashing victory signs and firing in the air. NATO warplanes have also been pounding the defences of Kadhafi’s forces in Sirte, focusing all of their firepower on the city since the loyalist bastions of Al-Jufra and Sabha in the south fell to NTC forces last week. The alliance said on Monday its aircraft had hit a command and control node, three ammunition or vehicle storage facilities, a radar facility, a multiple rocket launcher, a military support vehicle and an artillery piece in Sirte. Fleeing residents spoke of dwindling supplies of food and water and said Kadhafi forces had attempted to stop people leaving, while doctors warned of a growing humanitarian crisis. “The situation in the city is very critical,” said Muftah Mohammed, who drove out with his family and neighbours in a convoy of seven vehicles. “There is no food, no water, no petrol and no electricity. This has been going on for nearly two months now as Kadhafi forces would not allow us to leave. “Children are in a particularly bad condition,” he said. An AFP correspondent saw dozens of children receiving treatment at a clinic in the town of Harawa, 40 kilometres east of Sirte. “Since morning I saw nearly 120 patients and 70 percent of them were children. 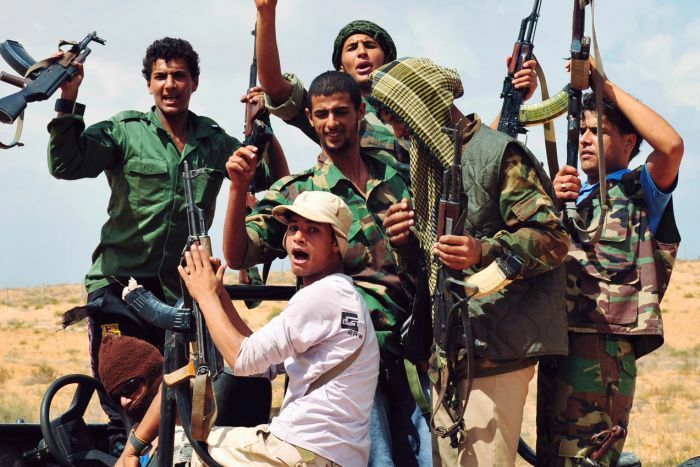 They are coming from some outskirts of Sirte and nearby villages,” she said. Two of Kadhafi’s men surrendered to NTC forces, fighter Maatiz Saad said. “They came to us themselves and surrendered their weapons and cars,” he said. But Libya’s new leaders are keen to capture the key members of Kadhafi’s family and entourage who remain at large, including the ousted strongman himself, so that they can stand trial. There have been repeated reports that one of Kadhafi’s sons — Mutassim — is holed up in Sirte’s southern outskirts. NTC forces believe Kadhafi’s most prominent son, Seif al-Islam, is in the other major enclave still in the hands of loyalist forces, the desert city of Bani Walid, southeast of Tripoli. Troops massed at Bani Walid’s northern gates pounded Kadhafi positions with artillery, tanks and anti-aircraft guns on Monday. NTC number two Mahmud Jibril, the interim premier, told the UN Security Council Kadhafi was a growing international terrorist threat. Even outside Africa, Kadhafi “could return to his terrorist practices by providing arms” to militant groups, he added.